Welcome to our Knowledge Portal. 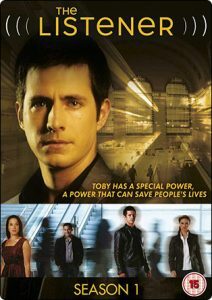 Season One (2009) - Toby is a 28-year-old first year paramedic who never knew his father and grew up in foster homes. Until now, Toby has kept his abilities to listen to people's surface thoughts and have premonitions a secret and the only one he has shared it with is his old counsellor and confidant, Dr. Ray Mercer (Colm Feore), prior to the series' first episode. While he crosses the city of Toronto in his ambulance with his partner Osman "Oz" Bey (Ennis Esmer), Toby helps people in crisis and on the way come to terms with his own past. With the help of Detective Charlie Marks (Lisa Marcos) and his on-and-off girlfriend Olivia Fawcett (Mylène Dinh-Robic), an E.R doctor, Toby realizes that his gift can serve to help other people. Season Two (2011) - It's a year and a half later and Toby has finally come to terms with his telepathic powers and is still working with his paramedic partner Osman Bey. While assisting with an undercover case investigated by the Integrated Investigative Bureau (a special unit of the Royal Canadian Mounted Police). Toby reveals his gift to Sgt. Michelle McCluskey (Lauren Lee Smith). Despite her initial skepticism, she realises that Toby's special abilities could be her team's secret weapon. So alongside his paramedic work Toby joins Michelle and other members of the IIB to help solve some of their most difficult and high-profile cases ranging from suspicious homicides to cases of arms dealing. But the price to pay for having such a gift is the emotional and physical effects of delving into some of the most deranged criminal minds out there and it is his old flame Dr Olivia Fawcett who helps him deal with his problems. Season Three (2012) - Toby stopped being a confidential informant for IIB after Liz Simmons was killed. He had been having intense headaches that Olivia said could kill him. He finds himself in trouble again after he goes into the bank that's about to be robbed. He makes the decision to go into the bank after withdrawing cash and Michelle and Dev race to team up with him and prevent the robbery. Klein finds out about his abilities after he demands to know why Michelle and Dev are so overprotective of Toby. It isn't until after the guard who was shot tells Michelle personal details about the robbers that he begins to believe it. He makes a deal to start a unit for cases that are either cold and/or can't be solved by normal procedures. Toby joins IIB as a special consultant, working for the IIB the majority of the time, while picking up shifts as a paramedic. Season Four (2013) - Bell Media announced the series was ordered for a fourth season on July 25, 2012. It premiered May 29, 2013 in Canada. Toby’s personal life heats up as his relationship grows with crime reporter Tia Tremblay (Melanie Scrofano), who is inexplicably the one person he can’t read. Sgt. Michelle McCluskey struggles through a complicated marriage with her husband (Kris Holden-Ried), while IIB head Alvin Klein (Peter Stebbings) attempts to protect himself and his team from the political maneuverings of the ambitious new police superintendent, Nichola Martell (Ingrid Kavelaars). Meanwhile, new director of emergency services Oz Bey realizes that being the boss is harder than he expected. Season Five (2014) - In this season, Michelle becomes the mother of a little girl with her husband Adam, whereas Dev begins to be interested in Alex Kendrick, a new scientist working for IIB. Oz left his job of paramedic and is now the owner of a restaurant, and Toby continues his relationship with Tia. Klein gets a promotion and leaves the head of the team to somebody that Toby already knows.